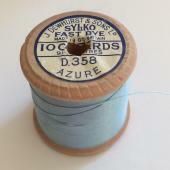 We hope that this reference will help if you have vintage Sylko cotton reels that you are keen to date. 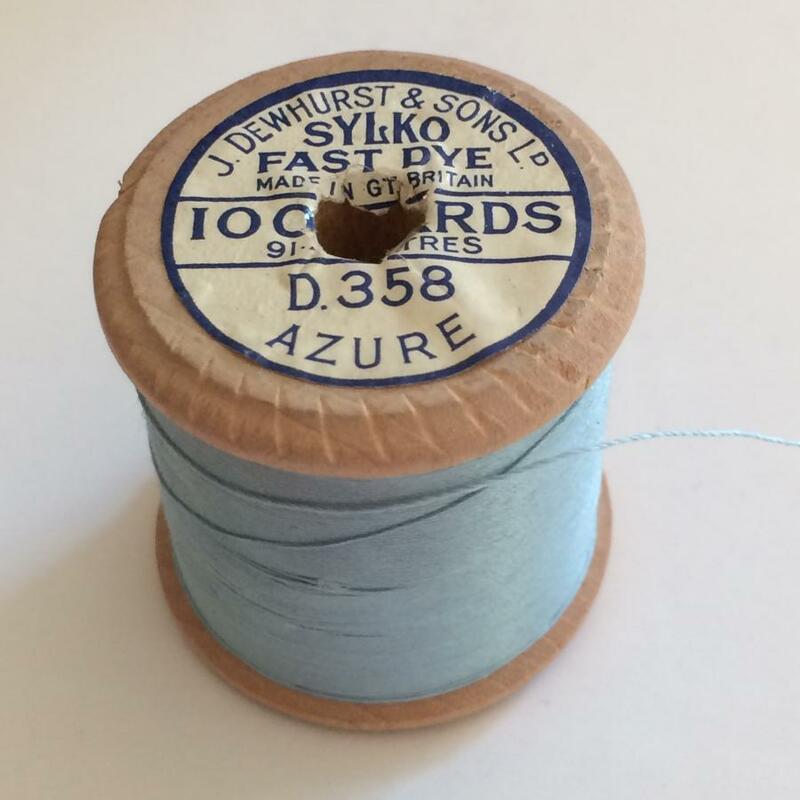 Confirming an exact date for any specific cotton reel is difficult if not impossible, however the labels did change over time and by comparing these to contemporary adverts etc. 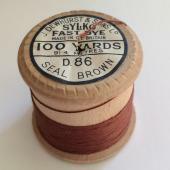 it has been possible to identify time periods where different reels were on sale. 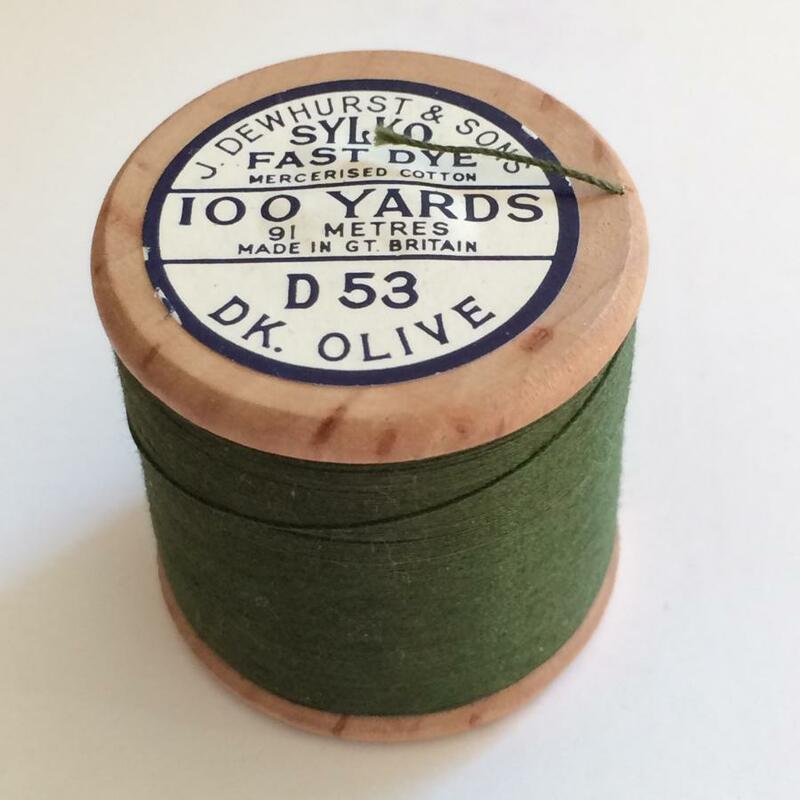 We don’t claim that this is 100% accurate and it is very much a work in progress, if you can help us with different label designs or further information then please get in touch. 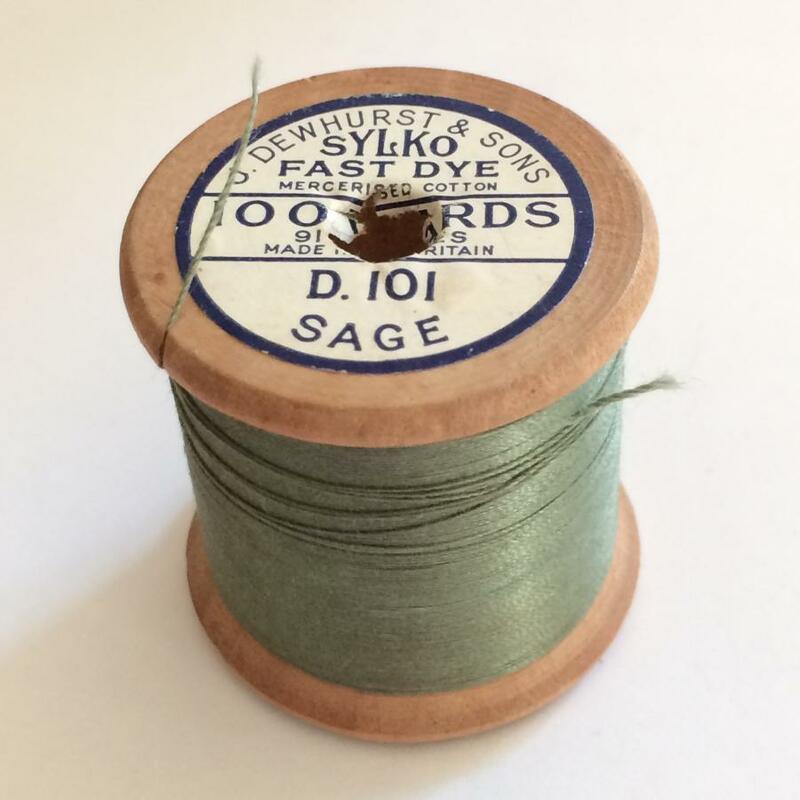 If you are interested in the different colour threads and their numbers then please check our list of thread colours and of course we have some for sale, check here. 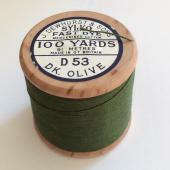 Note most threads appear to have came in both No 40 and No 50 weights. 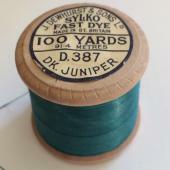 Number 40 was described as for “general requirements” and is the most common. Number 50 was described as a “…finer thread suitable for stitching the most dainty and delicate fabrics…” The red and the blue print were reversed on the No 50 on most labels. 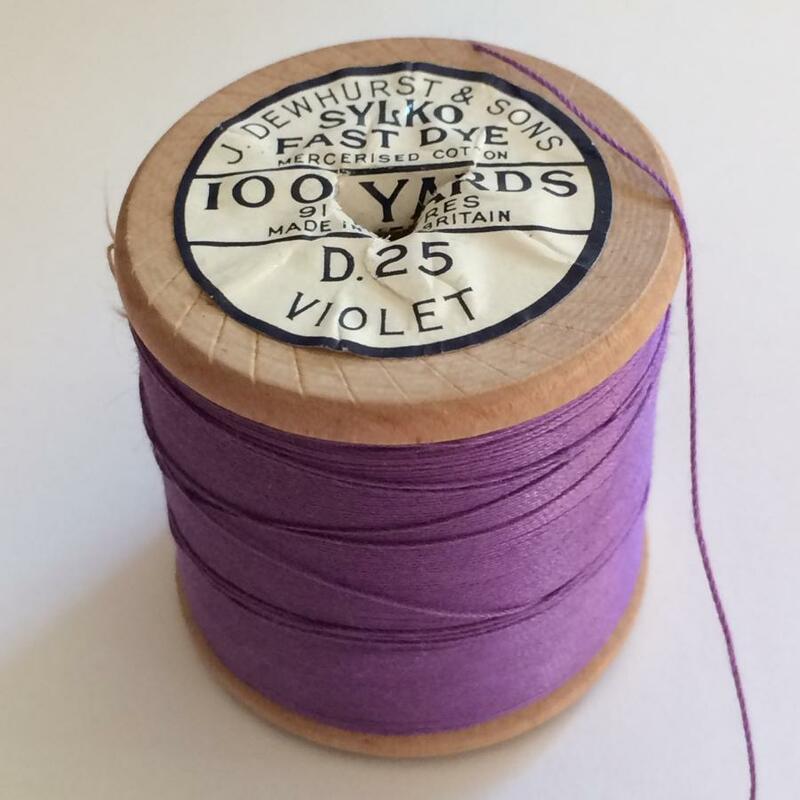 In the following we will refer to the label with the three shells design as the front/top and the label with the colour name and number as the rear. 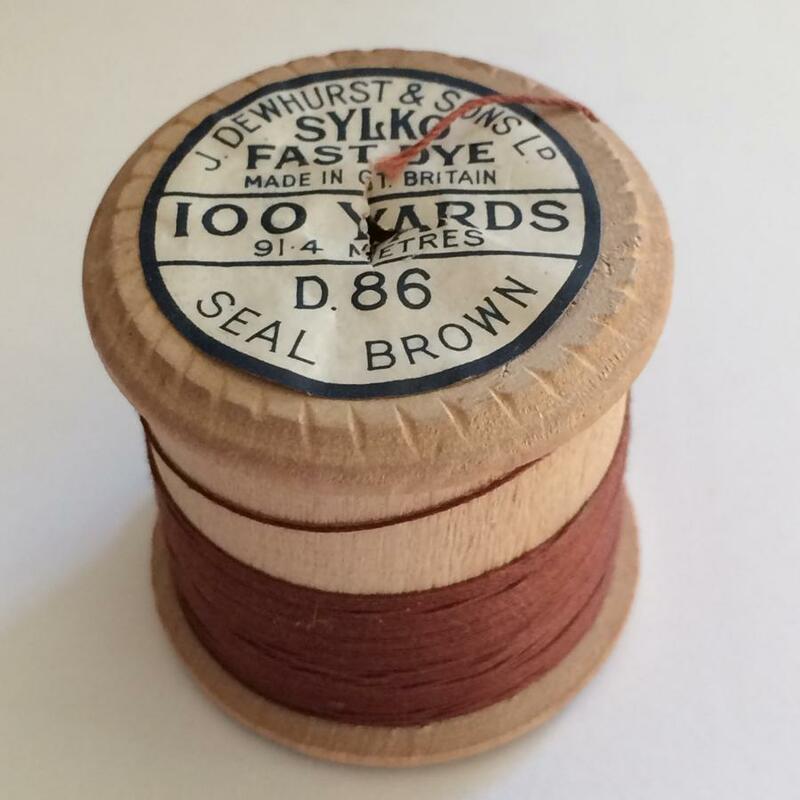 The above were all produced by John Dewhurst & Sons Ltd. We believe that they all predate the introduction of the Sylko brand name and therefore some, if not all, date from the mid to late 19th Century. On each example the top and bottom labels are shown above and below each other. 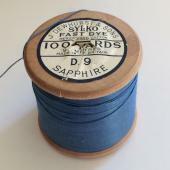 Note all of the top labels identify the spools are prepared for the Singer sewing machine. 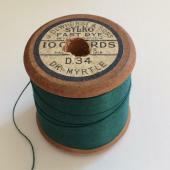 Singer machines were introduced in 1851 and were the most successful make of the newly introduced sewing machines. 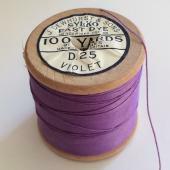 Note all of the spools illustrated are of varying sizes, we’ve identified their specific sizes in the image captions. 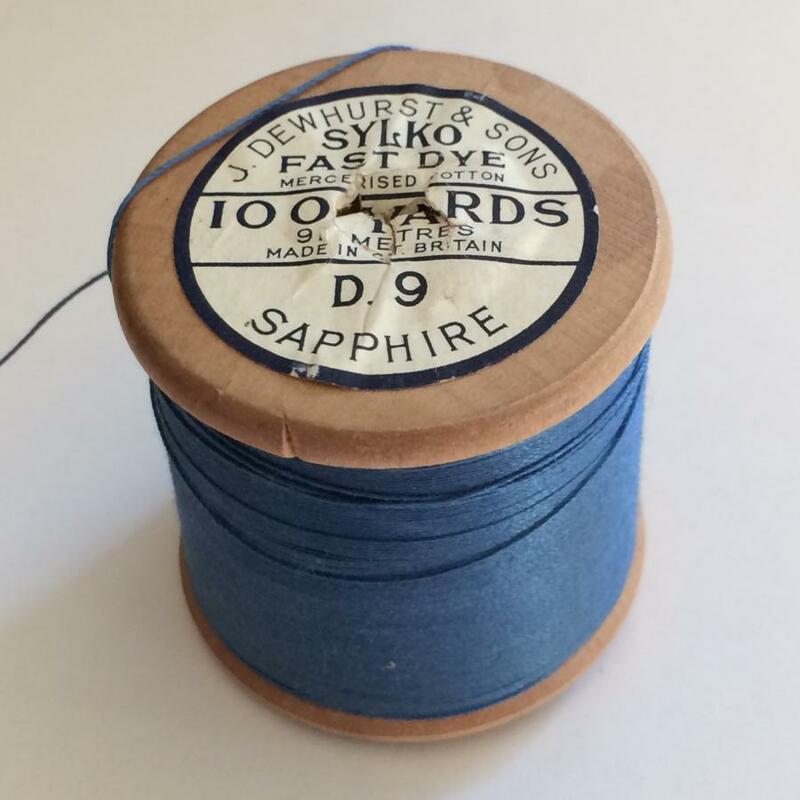 This front label dates back to at least 1909 though may have been used earlier and was used well in to the 1930’s. Note the town of Skipton (the base for Dewhust & Sons Ltd) is printed on the D.257 illustration. On later versions this was replaced with the text: “Made in Gt. 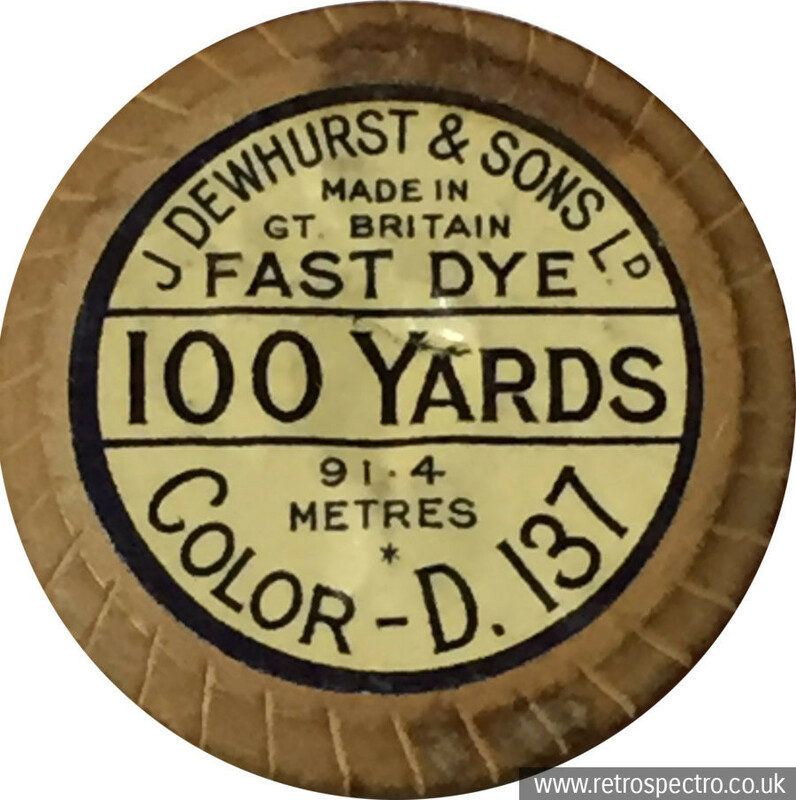 Britain” and “Fast Dye” as shown on the D.23 illustration. The thread weight appears on the rear label and not on the front as it did on subsequent designs. 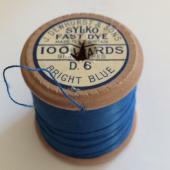 On this label type the No 40 weight was printed in gold and the No 50 in blue. 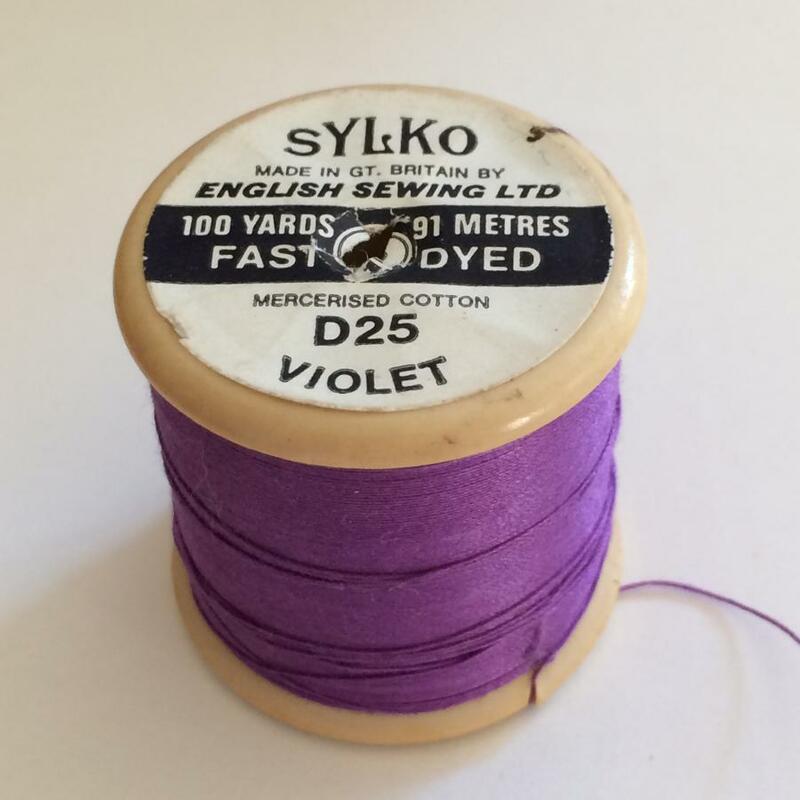 This front design was in use by 1938 (the previous style was still being used in adverts in 1937) and was used until the mid to late 1950’s. This still includes the words “Silk Substitute” and a thread weight is now given at the bottom of the front label. We have placed the rear labels in the order they were probably used (though there was in all likelihood some crossover). 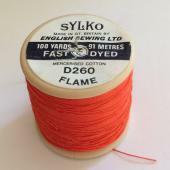 The first two type (D.137 and D.274) don’t give a colour name whereas D.136 etc. do. 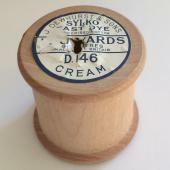 D.117 introduces the Sylko brand logo on the reverse label. 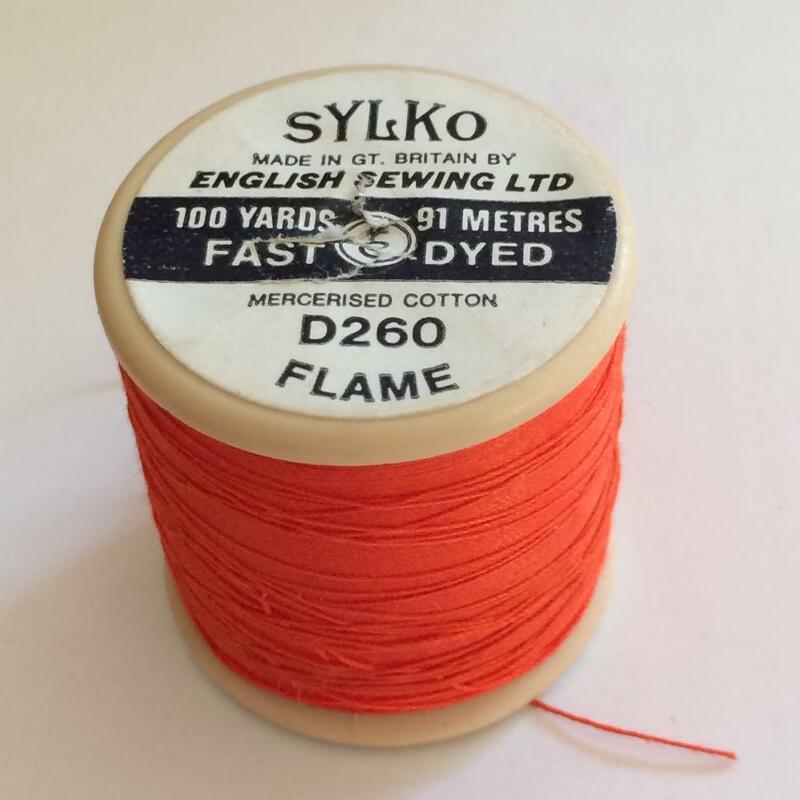 D.235 is an early example of the LD acronym being dropped and D.125 was probably the last style that was used with this front label design as it went on to be used with the next type as well (see below). D.274 is a larger reel with the front label showing 24/36 on the front image (we don’t know why two thread weights are apparently being given). 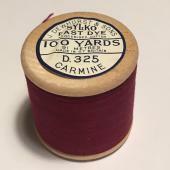 Note rear label is in black with gold print, it gives the spool weight as opposed to a length – 1 ounce (28.3 grammes). 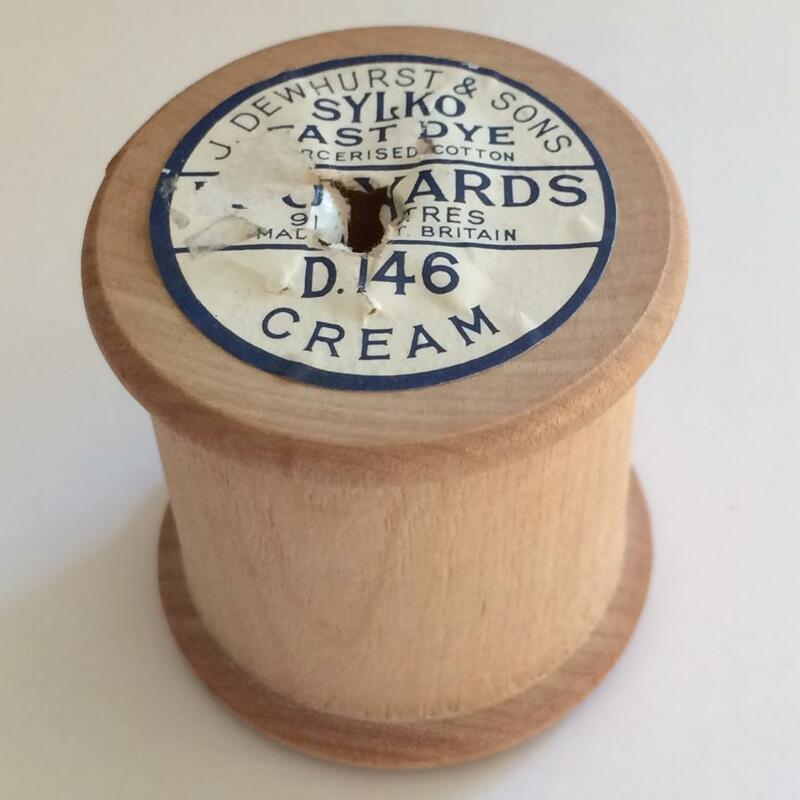 We have found both the D.136 and the D.117 style labels on small size (2.4cm high) reels, these were, we believe, produced in the war years as a result of drives to reduce the use of raw materials (wood in this case). 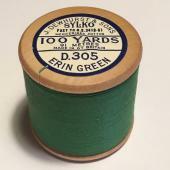 This front design was introduced between 1954 and 1958 and was probably used until the early 70’s. 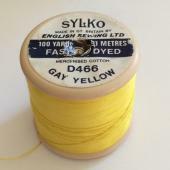 This featured on both wooden and plastic bobbins (the latter certainly by 1971 and possibly a little earlier). 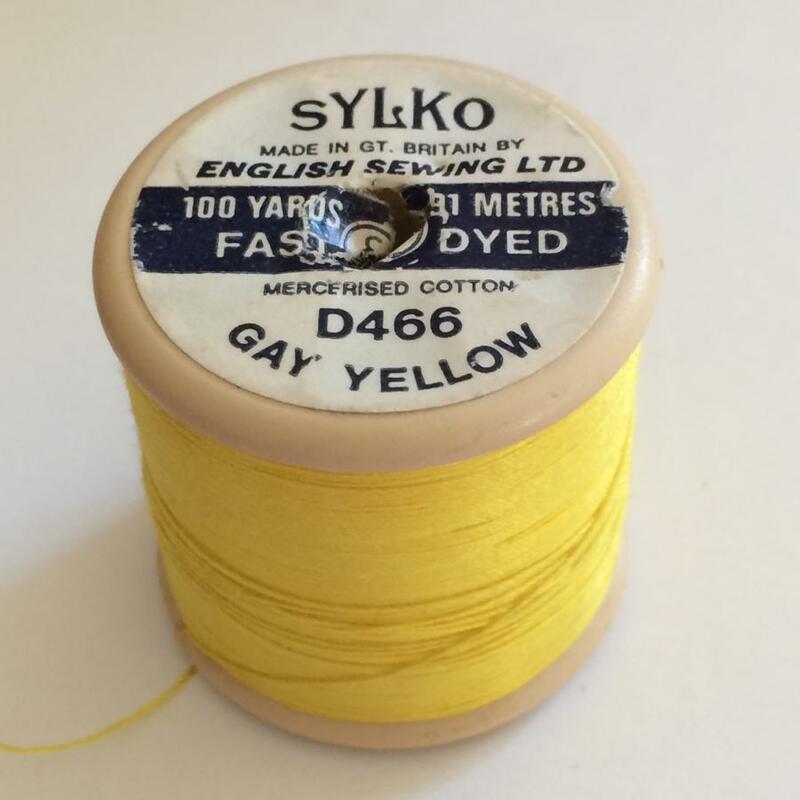 Note the words “Silk Substitute” have been dropped. This style of label was also issued on larger reels with a 36 weight. For the rear label there were a couple of different labels used on standard size wooden reels, note the second one illustrated (D.305) includes British Standard B.S. 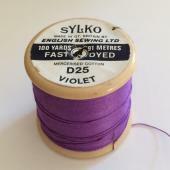 3418-61 which was for Domestic sewing threads (cotton and linen) and was introduced on the 25/9/61. 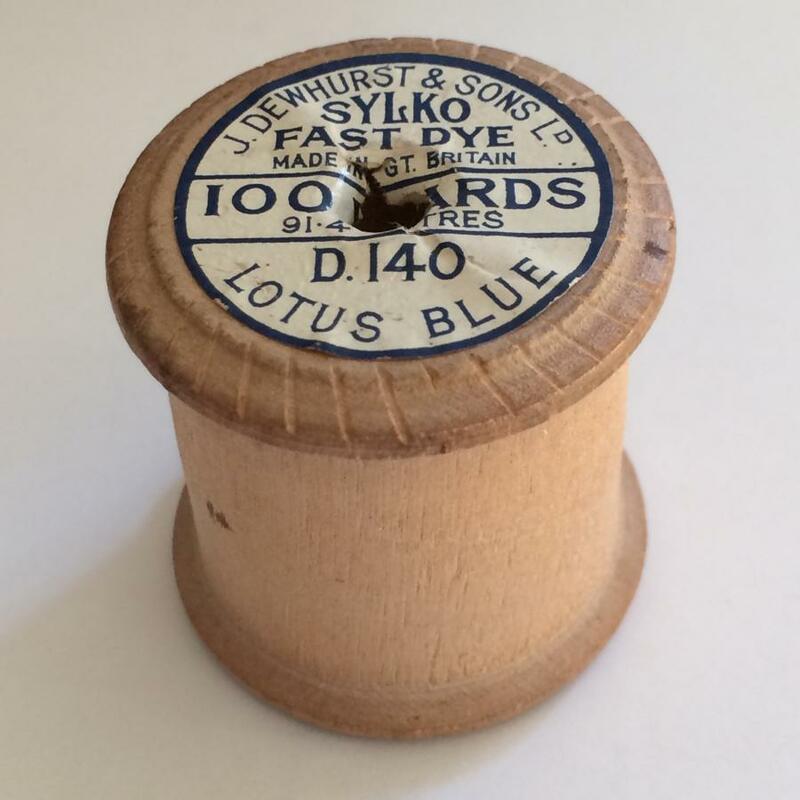 The D.123 illustration seems to be the earliest rear label used on plastic reels though D.460 shows that it was occasionally used for wooden ones too. 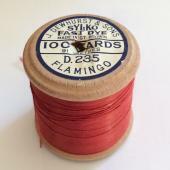 This front label was used on plastic bobbins only. 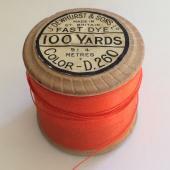 It was in use by 1973. Note the use of grey ink instead of blue on the top images (the No50 weight came in the blue as well as grey). 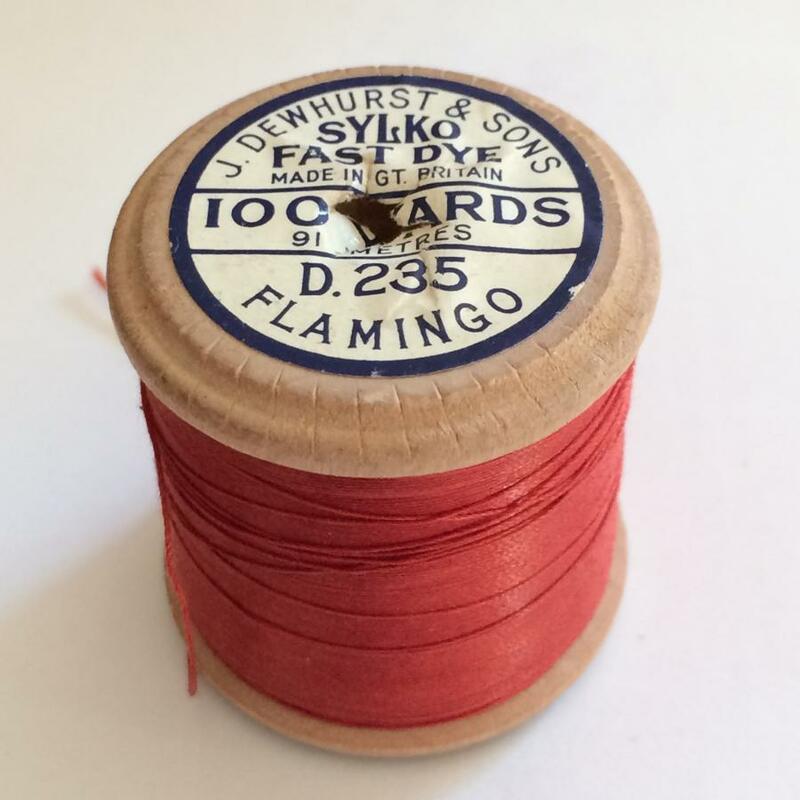 There were two distinct types of bottom label used, the one with the broader band came first and was similar, but not the same, as the style shown on the previous type. 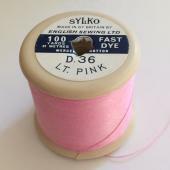 This was later changed to the thin band example (D314/D274), both types dropped the point after the D in the thread number. Note that on illustrations for D314 and D274 the order of the metric and imperial measurements has changed, this probably occurred in the second half of the 1970’s. 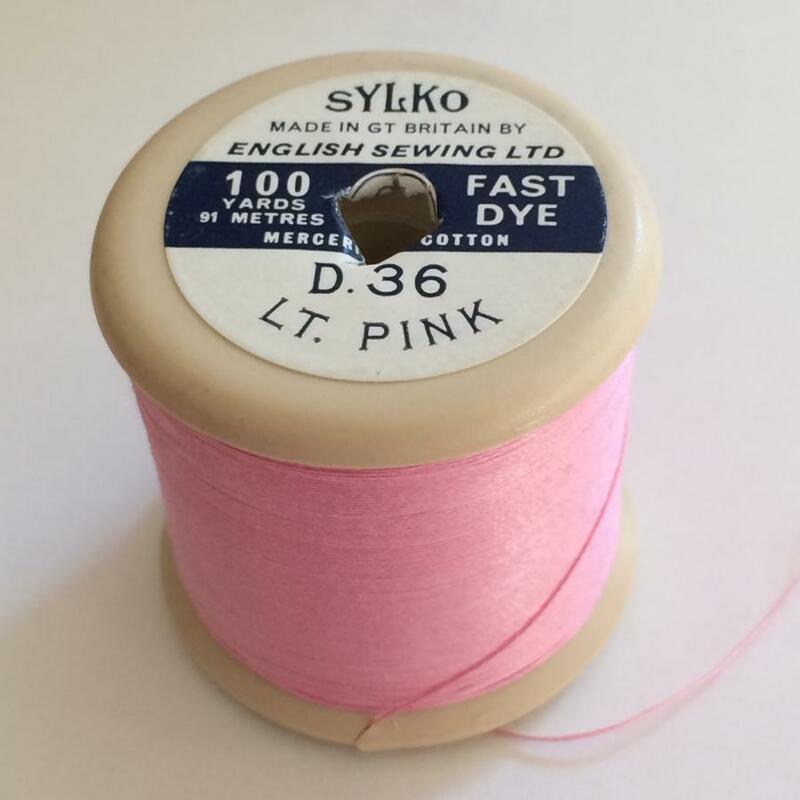 Dewhurst & Son’s produced the Sylko range of machine twist cotton, the most popular range of cottons used in the UK. The iconic Sylko label is instantly recognisable as a symbol of quality and the wonderful colours and evocative names given to the threads mean that there are many vintage and haberdashery enthusiasts who now collect the original cotton reels. 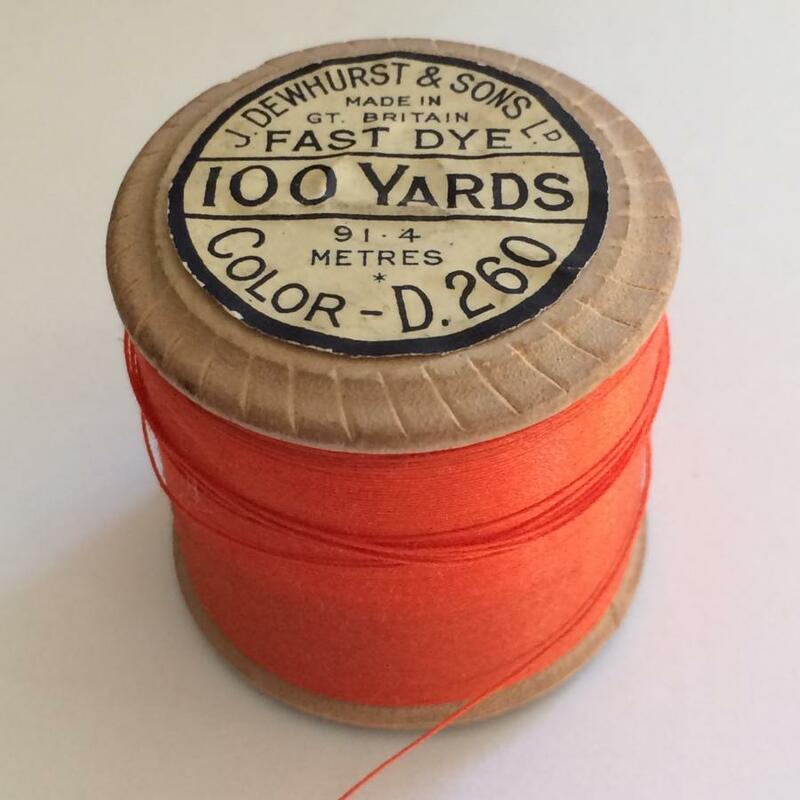 There were around 500 colours produced, originally on wooden bobbins (through to the 1960’s) and then on plastic ones (in the 70’s and 80’s). 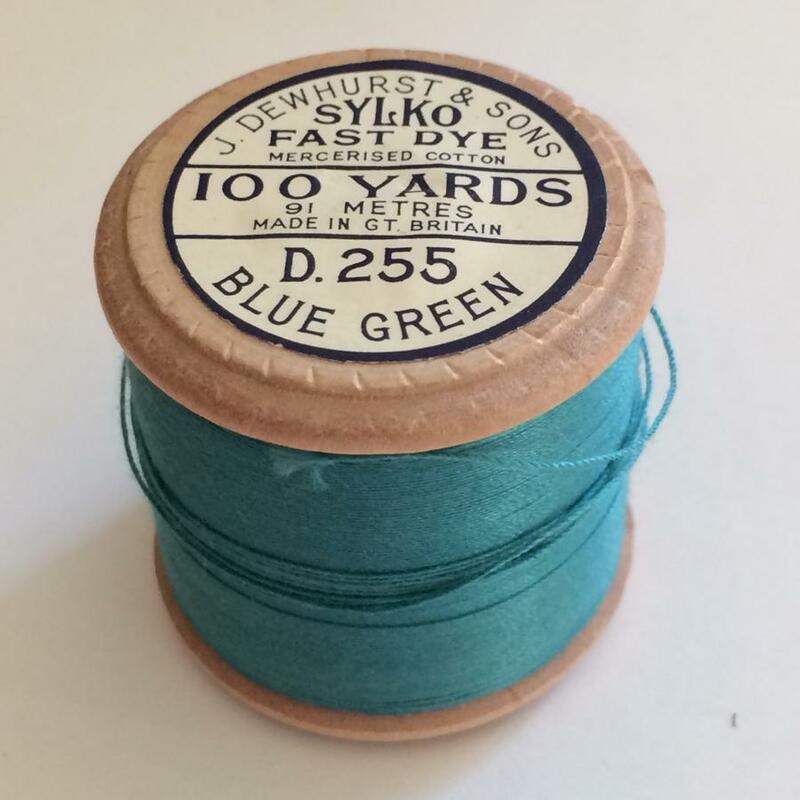 We only own a fraction of these but thought it would be worthwhile to illustrate these in a gallery for other collectors. 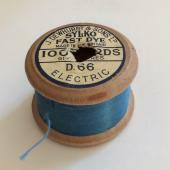 This gallery concentrates on the bobbins produced up to the early 80’s as we don’t collect the very last types. 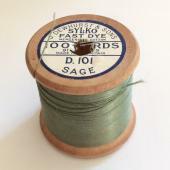 You can also scroll down for a fully sortable list of Sylko colors and a downloadable PDF list. 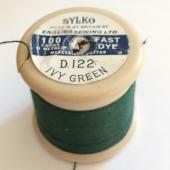 Sylko label designs changed over time, please see our other page for information on dating different Sylko label types. 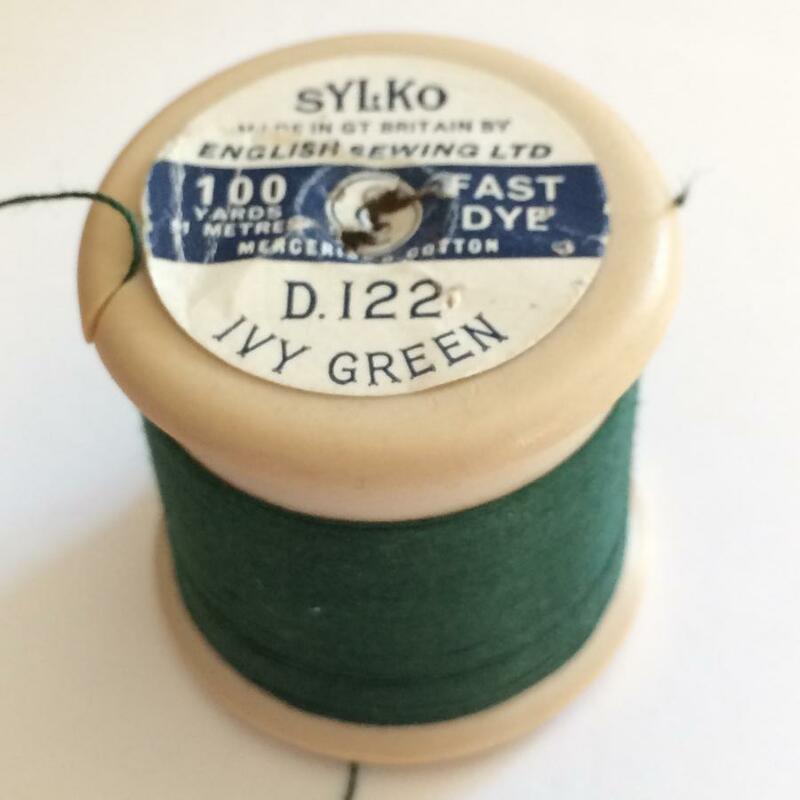 Here is the full list of Sylko colors (full but not complete – this is a work in progress). 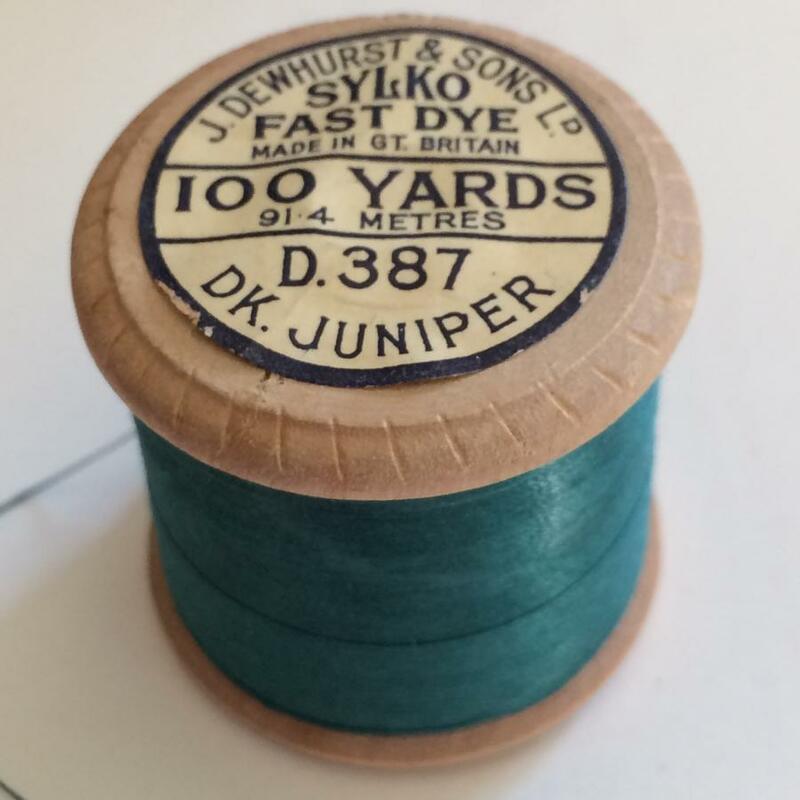 We have physically seen all of the listed colours unless there is a (?) against the name in which case these are unconfirmed. Similarly the Y indicates a confirmed wood or plastic wheel.